The fundamental importance of the periodontium in the functioning of the tooth has already been mentioned. However, this relationship needs to be explained in more detail. Every restoration that is fixed in some way to another tooth and hence puts extraordinary strain on that tooth will also influence the periodontium. This is why a precise understanding of the attachment apparatus is important for every dental technician. From a topographic point of view, the attachment apparatus is divided into the marginal, alveolar, and apical periodontium (Fig 3-28). As well as differences in structure, differences in forms of loading are found in the various segments. A restoration causes different loading of the natural tooth and hence the various segments of the periodontium. As a result, any damage to the periodontium caused by the prosthetic tooth differs in different segments. 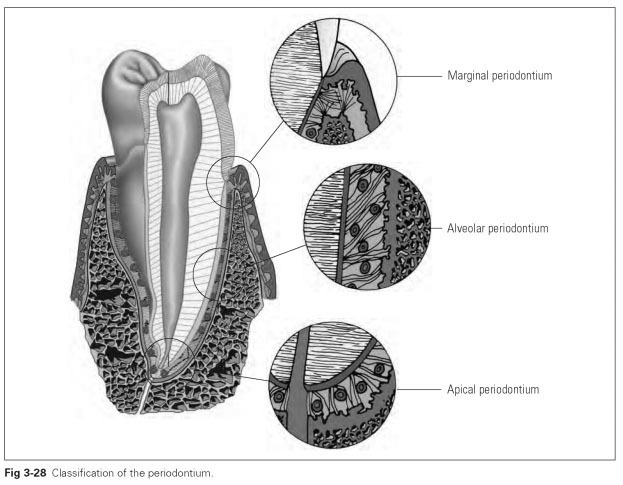 The structure of the alveolar periodontium is the same as the structure already described (Fig 3-29). In response to masticatory loading, the masticatory pressure is transformed into tensile stress on the hard tissue by the Sharpey fibers. In their resting state, the fibers are rather sinuous and thus permit a certain mobility of the tooth until, when stressed in their taut state, they transfer tensile forces directly. The load-bearing capacity of the alveolar periodontium is in direct relation to the quantity of fibers. The number of fibers in turn depends on the size of the root surface. Hence those teeth that have to absorb very large masticatory forces in the dentition also have larger or even several roots in order to provide a greater surface area to which the fibers attach. It has also been discovered that increased functional loading in the periodontium leads to an increase in fibers as well as strengthening of the alveolar bone mass and the cementum.The result is that when a tooth is fitted with a crown for a partial denture and more masticatory force has to be absorbed, the periodontium will adapt to this additional loading to a certain extent. 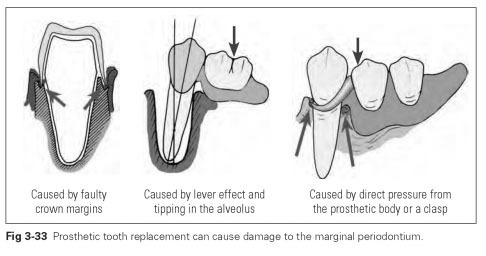 Apical and marginal widening of the periodontal space reflects tooth mobility. The space is narrowest around the pivotal point. The average force that the alveolar periodontium has to absorb during chewing is approximately 150 to 300 N (in extreme cases, up to 800 N).This force, however, can best be absorbed if it follows the direction of the vertical tooth axis, because this means the largest area of the tooth root is being loaded. 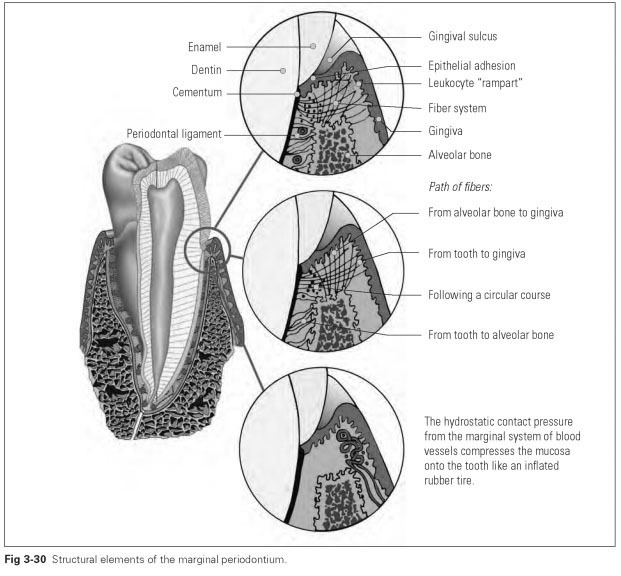 Horizontal forces only put a strain on individual segments of the periodontium. Tipping movements exert pressures in the marginal and apical periodontium, but these are not noticeable in the central area. In order to avoid compression, the periodontal space is widened marginally and apically. Damage to the alveolar periodontium occurs if the tooth is overloaded as an abutment or clasp tooth. The path of fibers in the apical area differs from that in the alveolar region. The functional orientation of the fibers is intended to counteract any tipping and lifting out of the tooth. 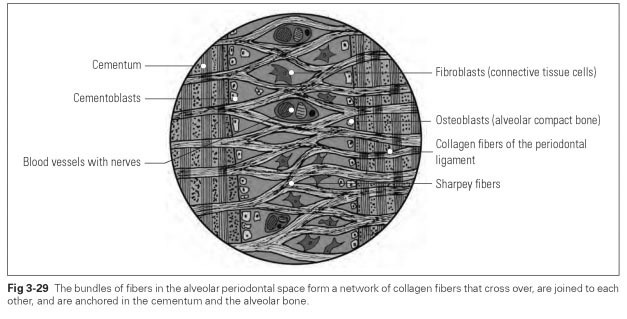 The fibers therefore run from the alveolar bone coronally and horizontally to the tooth. Damage to the apical area occurs if the tooth is tipped too much in the alveolus, ie, if there is incorrect loading caused by a denture. The peripheral segment of the periodontium, which forms the tissue seal to the oral cavity, is known as the marginal periodontium. 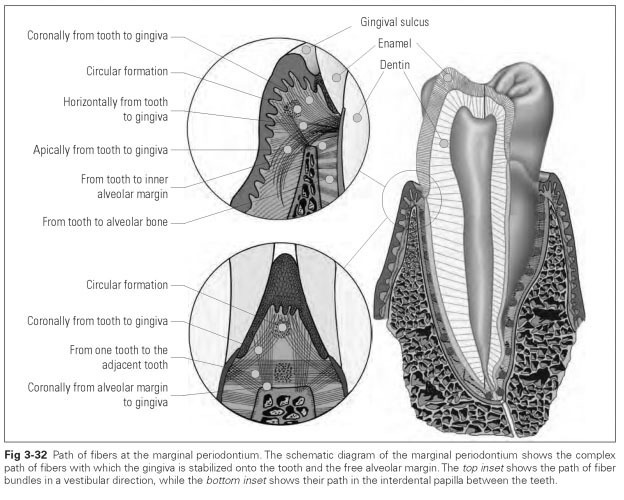 This tissue segment covers the alveolar margin and the in- terdental spaces. It helps to hold the teeth in the jaws, just as it aids stabilization of the teeth in the closed dentition. Two fundamentally different tissues are joined together here: hard tooth material and soft mucous membrane. This produces a firm and relatively resistant joint and an effective seal that protects against biologic and mechanical intrusion. The gingival sulcus (sulcus = furrow) is a narrow groove about 0.5 mm deep that runs in a circle between the gingiva and the tooth surface. The central wall of the sulcus is formed by dental hard tissue (mainly enamel); the outer wall is the normal mucosal epithelium, while the floor of the sulcus is made up of junctional epithelium, which also forms the epithelial attachment. The extent of the sulcus can differ from tooth to tooth and widen into periodontal pockets of varying depth as a result of mechanical influences or inflammatory processes and plaque. This formation of pockets then becomes pathologic and can lead to periodontal disease and tooth loss. The free gingiva is the narrow rim of tissue above the bony alveolar margin that follows the scalloped contour of the necks of the teeth or the cementoenamel junction. This rim of tissue is relatively smooth and between 1.1 and 2.1 mm high. It can be moved along the neck of the tooth but also away from the tooth, while the epithelial attachment to the tooth can be torn. Attached gingiva is bound immovably to the alveolar bone. This part of the mucous membrane has a different structure from the normal gingiva and varies in height between 1 and 9 mm. It is attached by connective tissue fibers, which start from the periosteum of the alveolar margin and the cementum, marking the course of the topographic borderline. Gingival stippling parallel to the cervical margin often arises from fiber processes. In the interdental space, the vestibular and lingual areas of the gingiva merge and completely fill this space as the interdental papilla when the approximal contact of the teeth is normal. The interdental papillae protrude occlusally in the lingual and vestibular regions, whereas they bend around the teeth in the interdental and apical areas. In normal conditions, the cementoenamel junction of the tooth is covered by the papilla. However, if the approximal contacts are open, the papilla may be displaced, which can result in a significant risk of caries because the cementoenamel junction or the cementum becomes exposed. The tissue seal to the oral cavity between the mucosa and the dental hard tissue is safeguarded by two attachment mechanisms.These are the adhesion of the junctional epithelium (epithelial attachment) and the connective tissue attachment by the fibrous apparatus. Hydrostatic contact pressure caused by the loop-type terminal vascular bed of the blood vessels provides additional support to these attachment mechanisms. All the mechanisms work together in the same way at the level of the cementoenamel junction. The gingival epithelium is similar to the epithelial lining of the whole oral cavity; it is only the specific junctional epithelium in the immediate attachment area that may differ. This tissue forms a ring of epithelium about 2 mm high, which starts at the bottom of the sulcus and provides the epithelial attachment at the cementoenamel junction. The junctional epithelium is a two-layer structure, with a basal layer that is active in cell division and a layer that is inactive in cell division. The intercellular spaces of the two layers differ in width, making this epithelial layer permeable. Before the teeth erupt, the junctional epithelium develops from reduced adamantoblasts of the enamel epithelium. Conversion from the reduced enamel epithelial cells into the junctional epithelium takes place during and after eruption and ensures the necessary attachment between the epithelium and the enamel. After that, the junctional epithelium is a constantly renewing tissue. The epithelial attachment is based on a biologic principle whereby the junctional epithelial cells stick to the tooth surface by adhesive and cohesive forces. The epithelium is able to stick to the enamel as well as the dentin and cementum. The junctional epithelial cells form the basement membrane to the dental hard tissues, which renews itself constantly. The junctional epithelial cells with their basement membrane are laid tightly onto the tooth surface so that the molecular forces can take effect. However, it is not the epithelial attachment with its minimal physical binding powers that is crucial to the functioning of this seal; the junctional epithelial cells themselves perform the defensive function. The epithelial and connective tissue structures have enormous powers of regeneration. The shedding of junctional epithelial cells is far greater than that of the normal gingiva. The wound-healing process in the sulcus is fully completed in less than 7 days after total mechanical destruction, after which it cannot be distinguished from the original junctional epithelium. The regeneration rate of the connective tissue parts is also unusually high. This excellent defensive activity allows rapid regeneration after inflammatory and mechanical changes. The permeability of the junctional epithelium in two directions is also a remarkable defense mechanism: firstly, substances that act as antigens penetrate the junctional epithelium and can trigger an antibody reaction; secondly, a flow of various leukocytes directed outward kills the invading bacteria. Around 30,000 neutrophilic granulocytes flow through the junctional epithelium every minute and enter the oral cavity via the floor of the sulcus. The lymph vessels supply the gingiva with numerous populations of leukocytes for defense, so that one could call this a leukocyte "rampart" to the marginal zone (see Fig 3-30). The tissue linkage between the separate teeth is provided by the differentiated paths of the fibers, as a result of which tooth movements are transferred to the closed dentition. The fiber systems of adjacent teeth are so closely interwoven that mutual support between the teeth can take place. If a tooth is tipped buccally, the neighboring teeth are involved as well because of the tissue linkage, or they prevent excessive tipping of the tooth. This tissue linkage also results in the physiologic mesial migration of the teeth. Tightening of the gingiva by tear-resistant fiber processes also provides protection against shearing when chewing slippery food. The processes tighten the marginal periodontium against the hydrostatic pressure of the blood vessels and shape the gingiva so that it is compressed onto the epithelial attachment. The hydrostatic contact pressure of the marginal blood vessel system supports the fiber system and the epithelial fusion.The blood vessels of the marginal tissue section are arranged as one-way passages. This leads to congestion of blood as the vessels swell up.They thus transfer the tissue pressure onto the mucosa, which then lies around the tooth like an inflated rubber tire and provides a tight seal. This is why the gingival sulcus must not be displaced; if it is, the epithelial adhesion might be torn off by the pressure from the blood vessels. Under minimal mechanical stress, this results in gingival bleeding (eg, when cleaning the teeth).